Summary : A better than average bagged peppermint tea, but which has no hope of competing with the quality loose-leaf peppermint teas of the world. Review : Mint teas and especially peppermint teas, besides tasting great (usually), also function as superb after-dinner teas. This is especially true following heavy meals, such as mexican food or a big Thanksgiving dinner. In short, peppermint teas are superb teas to relax the stomach following over-indulgence at the dinner table. And so it was following a heavy dinner of Chinese food that I found myself panging for a peppermint tea on a chilly Nevada November evening. So I dug through my selection of teas, and the first peppermint tea to show itself was one I just recently purchased - the Purely Peppermint herbal tea from Yogi Teas. Yogi Tea's Purely Peppermint herbal tea contains exactly one ingredient : organic peppermint leaves. Here is how Yogi Teas describes the tea: "Purely peppermint tea is the perfect way to lift your spirits and quiet your stomach, with a fresh flavor and aroma you’ll want to enjoy every day. The use of this refreshing leaf has been handed down from the ancient Greeks and Romans, who soothed their digestion after feast days with a sprig of mint. We use only the finest organic peppermint leaves to create a deliciously vibrant brew. Like chewing a fresh sprig, a fragrant cup of our peppermint tea can help ease minor stomach discomfort and tame occasional heartburn. Enjoy a warm, relaxing cup of purely peppermint for a refreshing after-meal delight!" The fragrance of the tea right out of the foil wrapper was what it should be, which is the wonderful fragrance of peppermint. However, the fragrance was by no means overpowering. The fragrance certainly doesn't compare to the nearly "knock you over" aroma of a quality loose-leaf peppermint tea. If forced to chose a word to describe the power of the fragrance, it would be "moderate." Still, compared to many other bagged peppermint teas I've tried before, the aroma was at least strong enough to get my hopes up that the tea itself would be, at a minimum, good. And I'm happy to report that is the case. While this peppermint tea won't win any awards for strength of flavor, compared to other bagged peppermint teas I've tried before this one is better than most - and light years ahead of the bad ones (such as the Typhoo Peppermint Tea and the Twinings Peppermint Tea). 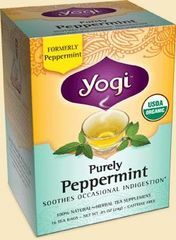 In short, Yogi Teas purely peppermint tea is an average peppermint tea. Something that is enjoyable to drink, but is also rather forgettable. And it in no way compares to a quality loose-leaf peppermint tea, such as Adagio's Peppermint Tea. There is, however, one notable feature of this tea and that is the after-taste. It's been my experience that a poor-quality bagged peppermint tea has, at best, a fleeting after-taste - and an after-taste that often isn't especially good, either. By contrast, the Purely Peppermint Tea from Yogi Teas has an after-taste that is pleasant and lingers on the tongue for a good fifteen minutes after taking the last sip. Overall, the Purely Peppermint herbal tea from Yogi Teas is a good bagged peppermint tea. While it will never compare to the powerful fragrance and flavor found in a good loose-leaf peppermint tea, for a bagged peppermint tea this tea is better than most. Recommendation : Yes. If you want the simplicity of a bagged peppermint tea, this one from Yogi Teas is better than most others you'll find on the grocery shelf or online. However, do keep in mind that neither the fragrance nor the taste compares to quality loose-leaf peppermint teas. Brewing Instructions : Pour 1 cup (8 ounces) boiling water over tea bag and let brew for 5-10 minutes. Eight minutes used for this review. Yogi suggests using 2 tea bags for a stronger tea.